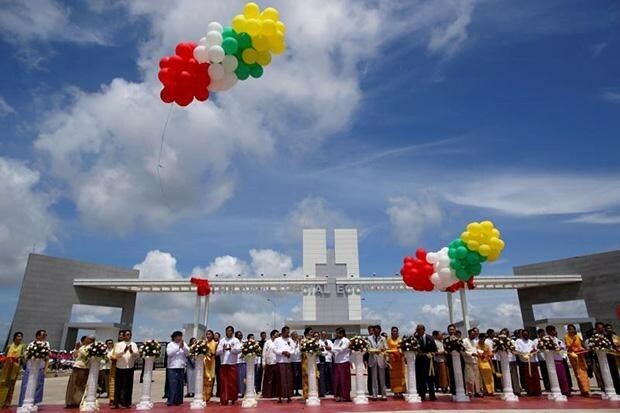 Myanmar Vice President Nyan Tun on September 23 inaugurated the first phase of Thilawa Special Economic Zone, aiming to lure more investment and creating jobs. The 2,400 hectare economic zone, built at the total cost of 1.5 billion USD, is set to host 100 factories employing some 40,000 workers when it becomes fully operational in 2017. The project has received support from the Japanese government and trading groups such as Mitsubishi Corp, Marubeni Corp and Sumitomo Corp as well as the Japan International Cooperation Agency (JICA). The Thilawa zone will contribute to boosting Myanmar’s ties with Japan, Vice President Nyan Tun said, adding that the project opens door for investors worldwide. The first phase has an area of 400 hectares, of which more than 70 percent has been rented to 48 enterprises from 13 countries. Foreign direct investment (FDI) in Myanmar rose to 8.1 billion USD in 2014 fiscal year from 329.6 million USD during 2009-2010.